“I did something terrible Grace. I hope you can forgive me…” Grace hasn’t been the same since the death of her best friend Charlie. She is haunted by Charlie’s last words, and in a bid for answers, opens an old memory box of Charlie’s. It soon becomes clear there was a lot she didn’t know about her best friend. When Grace starts a campaign to find Charlie’s father, Anna, a girl claiming to be Charlie’s sister steps forward. For Grace, finding Anna is like finding a new family, and soon Anna has made herself very comfortable in Grace and boyfriend Dan’s home. But something isn’t right. Things disappear, Dan’s acting strangely and Grace is sure that someone is following her. Is it all in Grace’s mind? Or as she gets closer to discovering the truth about both Charlie and Anna, is Grace in terrible danger? There was nothing she could have done to save Charlie …or was there? Wow! I am now hooked! Who wouldn’t be after reading that? It’s the info for LOUISE JENSEN’S thriller THE SISTER, which comes out TODAY!! And Louise just happens to be my Hot Holidays! guest today, too! ES: Welcome to Hot Holidays! Louise. Thanks so much for giving us some of your time on such an important day. Before we launch into the questions, tell us something about yourself. LJ: Of course! Well, I always wanted to be Enid Blyton when I grew up, and when that didn’t happen I got a ‘proper’ job instead. Then, several years ago an accident left me with a disability and I began writing once again, to distract myself from the pain and compromised mobility. But writing then turned out to be more than just a good distraction! I discovered that I love creating exciting worlds, dark characters, and twisted plots. I live in Northamptonshire with my husband, Tim, sons, a madcap spaniel and a rather naughty cat, and besides writing I also teach mindfulness. ES: Well, we’re all glad you went back to writing, Louise! So, tell us, where did you spend your last holiday and why did you choose to go there? 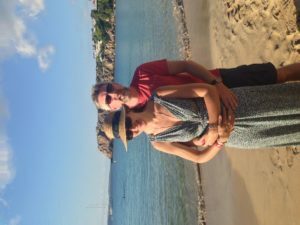 LJ: Our last holiday was in Menorca. I don’t like places that are too touristy and overcrowded and I’d heard lovely things about this small island. We hired a car and although we could cross from one side of the island to the other in an hour there was masses to explore, beautiful beaches and an amazing waterpark which make my son extremely happy. ES: Yes, it’s a beautiful, unspoilt place, isn’t it? And who doesn’t love a waterpark! Is that your favourite type of holiday? On the beach? LJ: My favourite kind of holiday is preferably somewhere without wi-fi! Holidays are a chance to spend quality time with my family and the destination isn’t really that important to me. That said, although I used to love camping when I was younger I wouldn’t want to be sleeping in a tent now. A proper bed and a bathroom are top of my wish list! ES: I’m with you all the way on that! Where did you spend your best ever holiday and what made it so memorable? LJ: My two eldest sons were small and we were sitting at the kitchen table eating our breakfast when the weather forecaster promised us a scorching day. ‘How about a day at the beach building sandcastles?’ I asked and they were so excited. I drove to Skegness and we had a fabulous day on the beach and they both said they didn’t want to go home. Unbeknown to them I had our luggage in the boot and had booked us into Butlin’s for the week. I will never forget how amazed and delighted they were and although it’s one of the least glamorous locations I’ve been to I will always treasure every single second of that week. ES: Aww! That gave me goose pimples! How lovely! Have you had any holiday or travel disasters? LJ: Following on from my above answer it was our first night in the chalet and my son got sick. Really sick. Everywhere. There were no spare sheets or toilet rolls and I used all our towels trying to clear up. Reception was closed and the boys were so small I couldn’t leave them to try to find a 24 hour garage. It was a LONG night. ES: I bet it was. Is there a place you long to visit and what are your reasons for wanting to go there? LJ: I’ve always wanted to ski. Health wise I couldn’t do it now but there’s something romantic about the notion of a mountain of snow, log cabins and hot chocolate. LJ: My family. My boys are growing and the eldest now holidays with his girlfriend instead. I’d love for us all to go away together. That said I’m happy with a novel and my own company too. ES: You’re never alone with a book, are you? I know you’ve got your lovely Tim, but have you ever had a holiday romance? Details, please! LJ: As a teenager I went to France and met a local boy. He didn’t speak very good English and my French was atrocious. There were lots of lingering looks and giggling and not a lot else! ES: LOL! How would you spend your dream twenty-four hours if you could travel to multiple, worldwide destinations with no travel restrictions? LJ: This sounds a little like a ‘Miss World’ answer I know but I’d genuinely love to take my boys to the poorer parts of the world where living conditions are hard, and there are none of the things we take for granted. We are so privileged to have the education system we have here and I’d like my boys to really appreciate the opportunities they have and to think about the way they can give back and help make the world a better place. ES: I think that’s something everyone should do, to be honest. And finally, what tip or piece of advice would you give to holidaymakers and/or travellers? LJ: Always pack a good book! Louise, thank you so much for being with us today, and all the very best for the book!